As geospatial technologies continue their march into the mainstream, GIS professionals no longer face a dearth of available data. Instead, they often find themselves swimming in a sea of undocumented and often redundant data. This makes it difficult and time consuming to find authoritative sources of GIS data. That is why building and maintaining a core set of basic framework GIS data is becoming more important. To do this, it is essential to have a robust data standards process, developed collaboratively, that makes sound data available in a centralized catalog. For almost 15 years, the State of Oregon has employed a unique method for creating such geospatial data standards. Dubbed the Oregon GIS Framework Program, it is a process of generating and maintaining GIS data that evolves with technology and can be molded to the needs of various government agencies and private organizations. Additionally, because it is voluntary and rooted in consensus, the program breaks down the barriers that typically divide government organizations and encourages different levels of government to engage with one another in meaningful ways. In 1994, the US federal government initiated a nationwide program to improve how people and organizations develop, find, and share geospatial data. Coordinated by the Federal Geographic Data Committee, state and local governments defined seven geospatial datasets that encompassed a framework of themes such as cadastral, transportation, elevation, and administrative boundaries. But the State of Oregon did not stop there. It expanded its framework to include eight more themes—including land cover and use, climate, hazards, and utilities—and has identified a more detailed set of over 250 data elements that form the foundation of the state’s GIS utility, navigatOR. The framework themes are the organizational construct for Oregon’s GIS Framework Program, which is guided by the Oregon Geographic Information Council (OGIC). The program has 15 Framework Implementation Teams (FITs), one for each theme. More than 450 volunteers from Oregon’s GIS community—working in local and state government, federal agencies, the private sector, and tribal organizations—comprise the FITs. Smaller workgroups of two to six people from these FITs are typically assigned to start the data standards development process. Those workgroups draw up the data content and data exchange standards that are reviewed by the larger GIS community and then, ideally, endorsed by OGIC. The Oregon GIS Framework Program uses a 12-step process for standards development. This method, which separates the technical aspects from policy and management considerations, involves different levels of GIS staff and management while incorporating the various perspectives of participating organizations. In the drafting phase, once a workgroup starts composing a new standard, the framework coordinator sends a notice of intent about it to the GIS community to inform others who might be interested and avoid redundant efforts. The workgroup then owns the standard throughout the drafting phase and incorporates any changes. When a first draft of the standard, called a proto-standard, is ready, the workgroup emails it to the relevant FIT for feedback. If no changes need to be made, the workgroup presents the proto-standard to the GIS community for review at a standards forum and by posting it online. Once all feedback is incorporated, the proto-standard becomes a draft standard. The workgroup then sends the draft standard for formal review to one of three advisory groups, depending on the subject: the natural resources group; the administrative, cadastral, and transportation group; or the preparedness, hazards, and utilities group. These advisory groups are formed as needed and consist of program volunteers who have a stake in the proposed standard. Once all feedback is integrated, the draft standard becomes a preliminary final draft standard. To begin the official endorsement process, the workgroup presents the preliminary final draft standard to a second standards forum to obtain consensus from the GIS community. If the standards forum identifies a problem, it returns the document to the workgroup for revision. However, if feedback can be incorporated without major restructuring, the workgroup does so and the preliminary final draft standard becomes a final draft standard. Oregon’s geospatial information officer then presents the final draft standard to OGIC for endorsement. If there are no major problems, the final draft standard is passed to the state’s chief information officer (CIO) with a recommendation for authorization. If the CIO authorizes the standard, all state agencies must adhere to it. Although authorized standards do not apply beyond Oregon’s state government, local, tribal, and regional governments find value in adopting the standards because they participate in the standards development process and, through their endorsement, agree with the need to adopt them. To date, the FIT has developed 28 endorsed framework data standards. Many of them have been amended over the years as well, to ensure their continued utility. In addition to authoring data standards, framework groups also develop data for their individual data themes and elements. A data manager at the Oregon Geospatial Enterprise Office (GEO) receives the data and stores the majority of it in a central location at the State Data Center, where it can be accessed through the Oregon Spatial Data Library. The public can access most framework data, plus a host of nonframework geospatial data, via this web-based portal. The framework coordinator at GEO also conducts a framework forum twice a year to introduce new data standards or amendments, educate the GIS community about upcoming standards and ongoing data development efforts, and gain the community’s endorsement for proposed standards. No governing body in Oregon has the authority to mandate geospatial data standards for all organizations. Rather, the whole process is rooted in cooperation. One of the most important aspects of the Oregon GIS Framework Program is that members of the geospatial community come to a consensus on endorsing and adopting data standards. Because multiple organizations in Oregon create data, the best way to ensure that data development is coordinated and efficient is to have all organizations agree to the standards. This consensus within the geospatial community also inspires willing organizations to act as data stewards by taking responsibility for datasets for which they have the strongest business needs. Those organizations ensure that the data under their charge remains current, accurate, and well documented and that data contributors adhere to the adopted standards. Having data standards and an active GIS community that supports them has been invaluable to the State of Oregon. The Transportation FIT ensured that data from more than 300 road authorities is now integrated into a set of statewide road centerline data. Through the Geoscience FIT, land management, geology, and agricultural agencies worked together to develop a statewide soils dataset. The Administrative Boundaries FIT also brought together multiple state agencies and local governments to create a standardized, statewide dataset for zoning, saving the Oregon Department of Transportation $150,000 to develop it itself. And those are just a few examples. Oregon’s standards development effort is key to the state’s comprehensive program for foundational, or framework, dataset development. It also supports government business processes at every level. When geospatial data standards are well crafted, they enhance the efficiency and cost effectiveness of any GIS investment. Caitlin Smith works on Esri's state and local government services team, where she supports planning agencies. Smith joined Esri after several years working at O2 Planning + Design, a Canadian planning firm specializing in geodesign solutions. 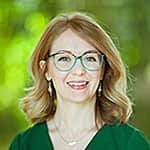 With a master's degree in landscape architecture and expertise in regional planning, GIS, and geodesign, she helps state and local governments plan the future of their communities using Esri's next generation technologies. She is also a faculty member in Penn State's Geodesign program.